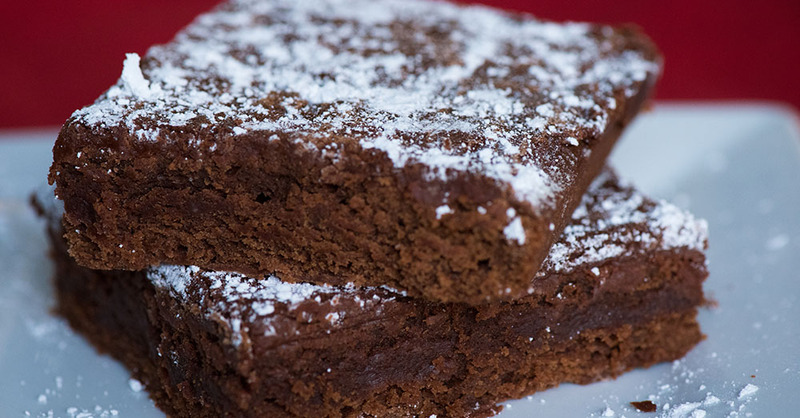 These From-Scratch Brownies Will Blow Your Mind! When it comes to baked goods, the term “from scratch” can be daunting, but these classic brownies are anything but. The ingredients are super simple and the recipe is so straightforward you’ll be whipping up batches of these rich and fudgy morsels all the time! And did we mention that we coat ours in chocolate frosting? Homemade frosting is pretty much the best thing ever, and we definitely snuck a few spoonfuls of it. Feel free to use box mix if you’re low on time, but trust us – the extra work is worth it! Preheat oven to 350º F, line a 9x13-inch baking dish with parchment paper, then lightly grease parchment paper with butter or nonstick spray. In a large bowl or mixer, cream together butter and sugar and mix in cocoa powder. Beat for 2-3 minutes, or until fluffy and smooth. Beat in eggs one at a time, then add in vanilla extract and espresso granules. Add in flour and mix until just combined. Don’t over mix. Pour batter into lined baking dish and bake for 25-30 minutes, or until toothpick inserted in center comes out clean. While brownies are cooking, cream together powdered sugar, cocoa powder and butter in a medium bowl until smooth, then mix in milk and vanilla extract. Once brownies have had a chance to cool slightly, pour frosting evenly over the top. Set aside until brownies have finished cooling and frosting is set, then slice, serve and enjoy!